Happy Friday- just a few more hours and it will officially be the weekend, so cheers to that! 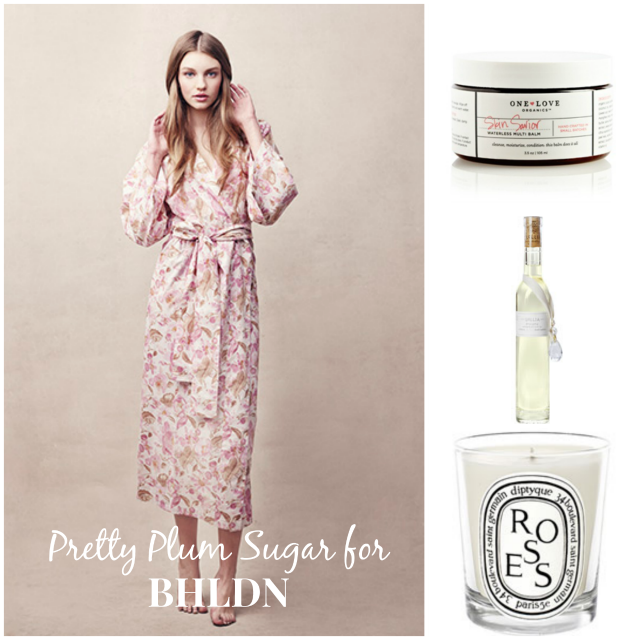 As most of you know, my favorite luxury sleepwear line is Pretty Plum Sugar. I absolutely adore the feminine details they add to their cozy and comfortable pieces. As if their line was not amazing to begin with, they've now created an exclusive collection for BHLDN. The soft, floral designs bring a touch of chic to your sleepwear and I couldn't be more in love. I recently got this romper from the collection and it is definitely my new favorite piece. One of my favorite parts of the day is coming home, running a hot bubble bath, lighting a candle and slipping into something comfortable. Why not have a little rest & relaxation in fabulous loungewear- you deserve it! If you haven't already, head on over to their site and see how beautiful this collection is. I haven't seen their rompers! I must check them out now! Happy weekend!